Cranberries are a native plant of North America and are a healthy source of antioxidants that support healthy aging and cardiovascular health. Cranberry extracts have also shown promise in the prevention of tooth decay. 2 Historical use of cranberry fruits fora variety of problems, such as wounds, urinary disorders, diarrhea, diabetes, stomach ailments, and liver problems has been validated by recent studies. 1 Today most of the medicinal interest in cranberries is in the area on urinary tract health, indeed drinking cranberry juice at the first sign of a UTI is one of the best known home remedies. Cranberry juice helps flush out the urinary system by keeping bacteria from getting a foothold in the lining of the urinary tract. 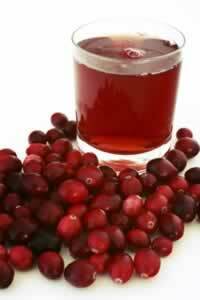 3 Cranberry juice has also been used infrequently in conjunction with antibiotics to treat chronic kidney inflammation. Some people concerned about their intake of sugar have turned to dried cranberry capsules, and powders. Preparation Methods & Dosage :berry juice, capsules, as a relish. Cranberry powder can also be used for bladder infections. Just add to teas or smoothies, or make capsules. Be sure to drink plenty of water. Drinking the juice is good too, but it is hard to drink enough to affect a stubborn infection. Cranberries are a group of evergreen dwarf shrubs or trailing vines found in acidic bogs throughout the cooler parts of the Northern Hemisphere. 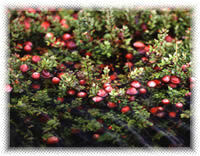 Cranberries are related to the bilberries, blueberries, and huckleberries, all in Vaccinium subgenus Vaccinium. The flowers are dark pink, with very distinct reflexed petals, leaving the style and stamens fully exposed and pointing forward. They are pollinated by domestic honey bees. The fruit is a berry that is larger than the leaves of the plant; it is initially white, but turns a deep red when fully ripe. It is edible, with an acidic taste that can overwhelm its sweetness.